You’ll often hear our team use the phrase, “Always be launching!” What we mean by that is don’t have one Launch Weekend, and then pack up the Launch Kit and stow it in that room in the rectory basement that no one ever goes in. The Launch Kit is meant to be used all the time. For instance, your Launch Kit included a banner that is specific to your parish. Keep it up! It’s a good idea to move the banner from time to time, since people get used to seeing it. You might put it in the narthex for a few weeks, and then move it to your parish hall. You might put it in the school or religious education entrance for awhile. The point is, you’ll always have new people who will see it for the first time, and you might have parishioners who’ll simply notice it for the first time. 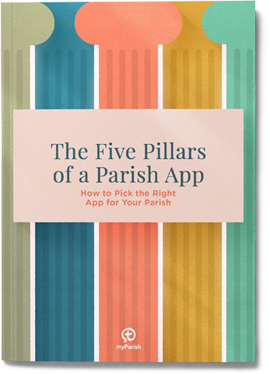 In any case, keeping that banner front and center is a great way to remind people to use myParish App. Craft great messages for the best results. Sending messages via myParish App is a terrific way to keep your parishioners informed. However, there are a few tips to create great messages, making them more effective. Include most relevant at beginning of message because that’s what shows in a push notification. Send your message now, and then add as an event to remain on calendar. Use messaging and events together to keep information available on the calendar. This message is really unclear. It doesn’t tell parishioners when they would be needed, and there is no phone or email included so that they can easily contact the office if interested. They would have to hunt around to find the contact information. Then, make sure you put this event on the app calendar. A few simple tweaks to a message can make a big difference! myParish App isn’t just about the features you see on the screen. If you do a little creative thinking, you can use the app in some unique ways. With just a little effort, your parish community can use myParish App to stay connected to the world-wide Catholic community in prayer, and learn some new things as well.